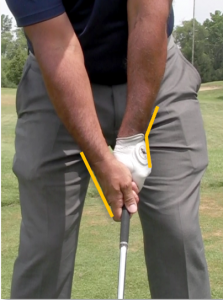 In Figure (1), the back of the left wrist starts at initial address with a fair amount of angle or “cup” to it. The back of the right hand is flat with virtually no angling at all. Moving away from address, the initial angle in the left wrist is “carried” intact for approximately the first 10-20 inches of the takeaway. 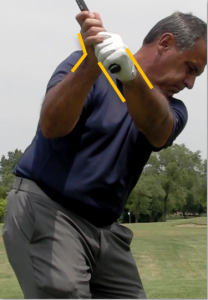 You can see in Figure (2) that while the forearms have turned 90 degrees relative to address, that the angle along the back of the left wrist is virtually unchanged. A slight angle has now formed along the back of the right wrist with the angles of the two wrists looking fairly symmetrical at this point. 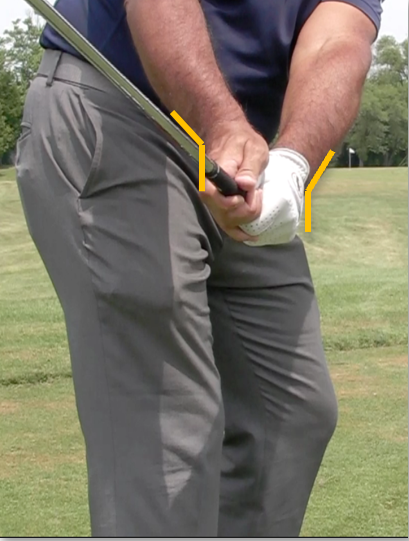 As the hands and arms climb further upward from shaft parallel, the left wrist finally “relaxes” into a joint-neutral position relative to the left forearm. This can be seen in Figure (3) where the left wrist is now in a straight “neutral” position running straight down along the forearm. Notice how the left hand and forearm fit neatly in between the brackets of the two yellow parallel lines. At this point the angle of the left wrist, which originally held 100% of the combined wrist angles at address is now zero. Virtually 100% of the original left wrist extension at address has fully “transferred” itself into the right wrist by left arm parallel to the ground, and the right wrist now holds 100% of the combined wrist angles. From here, all the golfer has to do is finish winding his body to the end of the backswing.